What are bed bugs and what do they look like? 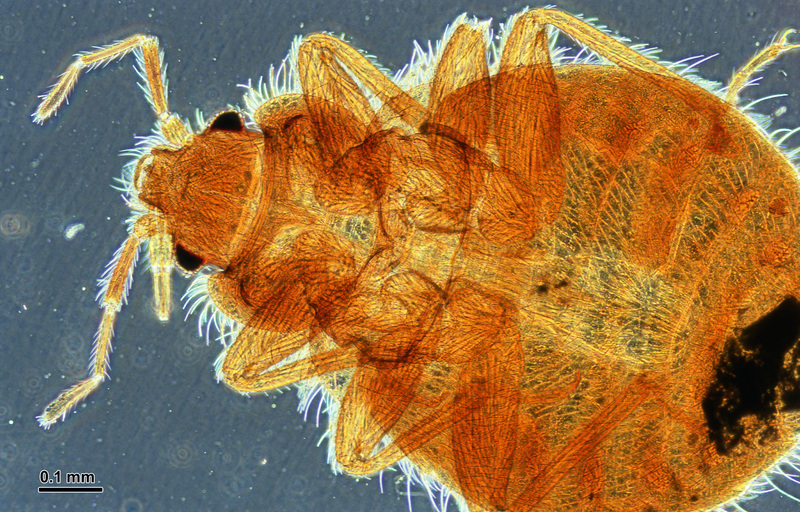 Bed bugs are parasitic insects that feed solely on human blood. They are tiny, wingless, rust-colored, and flat in shape. They are roughly 1-7 millimeters in length, which is barely bigger that a comma (comparable in size to Abraham Lincoln’s head on a penny). Who is at risk for getting bed bugs? Are they related to poor hygiene or living conditions? Can bed bugs spread disease? What health risk do they pose? Bed bugs are not known to transmit any disease, and so their presence is considered more of a nuisance than a health hazard. They feed during the night, and the worst they can do is cause itchy bites and loss of sleep. That being said, there is a small minority of people who may experience a severe allergic reaction to their bites. Excessively scratching their bites can also lead to skin infection or scarring. How can I know for sure whether I have a bed bug infestation? What are the telltale signs? Identifying bed bugs can be tricky. Since everyone reacts differently, some people may not have noticeable bite marks or the marks may take as long as 14 days to develop. Bite marks may be visible anywhere on the body and are commonly seen on the stomach, face, arms, etc. Since the marks can be confused with the bite of mosquitoes, fleas, or even a rash, it is important to verify that you have an infestation in other ways as well. Although bed bugs can spread all around a room or even a whole apartment, they will be in their highest concentration around the bed itself. Carefully inspect the seams, folds, and creases of any affected mattresses. Check the seams of the sheets and pillow cases as well. Search the nooks and crannies of the headboard. It helps to use a flashlight. Look for tiny rust-colored spots along the creases and folds of the fabric. These spots of blood or excrement are a sure sign of bed bugs. Look for tiny exoskeletons left behind after molting. Although bed bugs are small, they are visible to the naked eye and can sometimes be spotted this way on the mattress. If possible, place double-sided tape around the legs of the bed-frame to trap them as they climb onto the bed. Once I am sure that I have bed bugs, what can I do to prevent against spreading them? What are the signs of a severe infestation? Seeing bed bugs during the day and seeing them on the walls or ceiling are sure signs that you have a bad infestation. Consider discreetly alerting your supervisors at work and taking special precautions not to spread the problem. Bed bugs are sensitive to the heat, so anything that can be put in the dryer on high heat will be decontaminated. What is the best way to treat bed bugs? If you are not able to determine on your own whether or not you have bed bugs, call a qualified exterminator and schedule an inspection. Sometimes a trained bed bug sniffing dog may be used to detect the bugs but this is not always necessary. Aerosol-based sprays, or “bombs” are not only ineffective against bed bugs but they may actually make the problem worse by spreading them to other rooms. Since aerosol treatments kill on contact, most bed bugs will scatter and flee into other spaces, and seek shelter in any available cracks and crevices. Although the situation may appear better in the short term, enough insects usually survive to repopulate and often crop up in new areas as a result of the “bomb”. Some companies offer services where the temperature is raised throughout the whole house to a level that will kill all the bed bugs. This treatment, although widely available, should not be considered safe due to the numerous examples of house fires caused by this method. Examples of this can be found here and here. Treatment using cold is also risky, and can cause damage to property or personal effects. The safest and most effective methods are labor intensive, and that kind of work is best left to a professional pest control company. At Arrow Exterminating, we employ a variety of modern and effective techniques, such as detecting bed bugs with our trained rat terrier, Polly. Under the guidance of our on-staff Entomologists, a thorough treatment is applied to all affected surfaces using non-hazardous materials. Furniture, floors, walls and ceilings are carefully inspected and treated as needed. Instructions are given for de-lousing clothing and personal items, and if necessary a heat chamber can be provided for certain items. Special mattress covers and pillow cases are provided which makes it unnecessary to treat them directly. Although dealing with bed bugs is never fun, this information is meant to address some common concerns about bed bugs and confront some common myths. All of this information can be used to inspect your own property or hotel room like a pro, and make an informed decision about treatment. This entry was posted in Uncategorized and tagged Arrow Exterminating, bed bug, bed bugs, DIY, exterminating, home inspection, how to, Pest control, trained dog on August 15, 2014 by ArrowBugBlog.